Over the weekend, word got out that Jordan Brand had plans to release an Air Jordan 9 in honor of Carmelo Anthony’s 2003 National Championship with Syracuse. Inspired by the Most Outstanding Player of the Tournament trophy, the offering utilizes a wood grain overlay and a metallic gold midsole unit that is guaranteed to turn heads. Dubbed the “MOP Melo”, it further commemorates that Most Outstanding Player designation which culminated with a ridiculous 21-10-7 stat line in the Championship Game. Melo’s number 15 replaces the customary 23 on the heel, while his monicker can be found in script on both insoles. 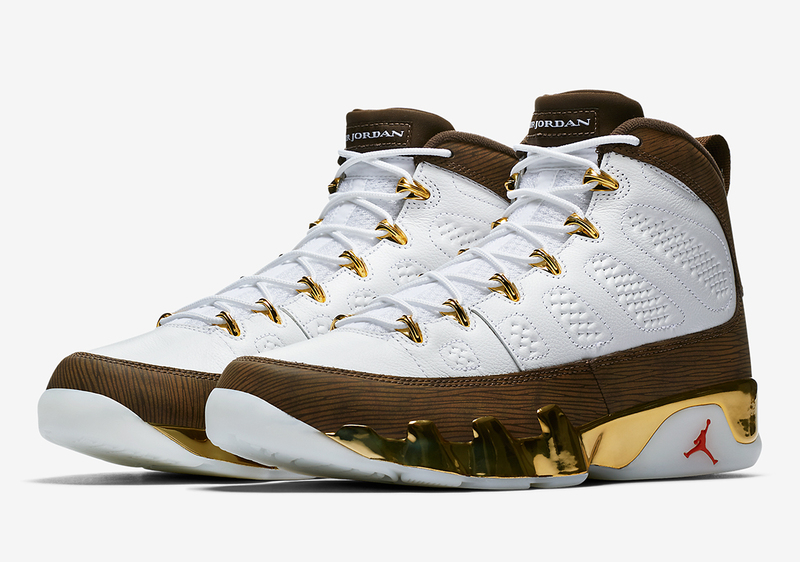 Fittingly, the Jordan Brand has elected to use the Air Jordan 9 for this tribute which is well documented as the future Hall of Famer’s favorite silhouette. Grab an official look below and mark your calendars for its April 27th release.